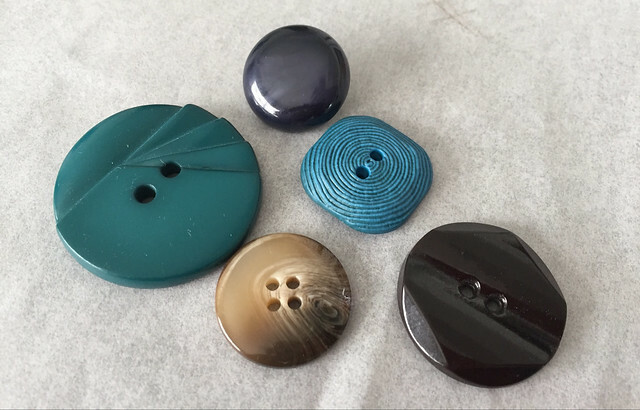 SunnyGal Studio Sewing: Random Threads # 34: buttons, 30 wears, and can you be too dressed up? Random Threads # 34: buttons, 30 wears, and can you be too dressed up? Time for another Random Threads post, it's been a while. The last one was in October and as usual I have a number of topics jotted down on a page in my notebook. Also as usual I have a couple of cryptic notes that probably made sense at the time but today have no meaning. Here's one "measuring suits". I wonder what I meant by that? Yes I resolved to write out my thoughts more clearly so weeks later I could remember - didn't happen:). We shall never know what that topic idea would lead to. But the rest of my notes make sense so let's dive in. 30 wears: I've seen this idea around for a while - the challenge to think about whether you will wear something at least 30 times before you purchase. It's a good contrast to fast fashion and the disposability of a lot of ready-to-wear, and takes a more sustainable view of our wardrobes. But what about if you make your clothes? I bet I have a lot of things I made that will never achieve 30 wears, and yet I have a lot of garments that I have kept and worn for upwards of 10 years, worn possibly hundreds of times. Do the two balance out? I'm not contributing to the landfill as so much of my handmade wardrobe is still in my closets, mostly because I can't bear to part with most of the things I've made. I've said before that I think something you wear to a special occasion or a party is almost like a costume - I'm not interested in perfect insides and want to sew those items up fast. And perhaps even pass them on to a friend so they can wear to a party with a different group of people. Coats and jackets - they get the long term treatment, sewn as well as I can, linings that will last, true investment pieces. I think the 30 wears idea is smart, particularly when it comes to shoes, belts, bags - those should be useful and I find the items that I buy thoughtfully and think about future wearings stand the test of time. Spare buttons: When you buy a shirt it often has a spare button, which I would snip off and stick in the button jar. And people so often give me the remainder from their closet clean out, which means I have a lot of orphan buttons. But what about when you sew a shirt. Think about all those aforementioned silk blouses and other shirts I'm wearing. Do you set aside an extra button in case you lose one. I'm starting to think I should. New idea is to make a card and attach 1 button each time I make a shirt with a short notation as to which shirt it goes to. For coats and jackets I always buy one extra button - often they are $ 5 buttons and if I lose one I want to be able to replace and not have to invest in a whole new set! Dressy vs. casual style: Do you find yourself sewing up things that are slightly too fancy for your day to day life but you want to wear them anyway? and then people ask the very annoying question "why are you so dressed up?" I wonder if this is a distinctly American question or does it happen everywhere? I dress as my mood takes me, so sometimes I might be a little too dressed up for the occasion - but as stitchers we know the feeling when you've just finished an item and you want to wear it - whether or not the time is ideal. Lately I've been liking the feeling of silk blouses, and decided that I would wear them anytime - regardless of my day's activities. Perhaps this happens more in the winter - the very nature of summer clothes is more casual. And then there is that word fancy. I think this is a word that Americans can understand in the context - we would say things like "come over to eat on Sat, nothing fancy" or "the party was really fancy" or I want to look good but not too fancy" Am I overthinking this word? chime in and tell me if you know just what I mean. I've asked friends from around the world and I find it hard to make an exact translation - in England does fancy mean a costume occasion, and/or a desire? And my Italian friends offer "elegante". I do love all things linguistic, whether word origin, usage or languages so maybe I just pay more attention that is warranted to this one. Fashion and Politics intersecting perfectly to me: I happened to see the new Instagram ExcellentCoatsonIrritatedWomen the week that it started, and wow, this has given me a lot of glee over the last month. The profile pic kind of says it all (Nancy P in that fab Max Mara coat) but who knew there were so many great photos of inspiring women wearing great coats. Check it out. Stuff not yet blogged: It sounds so trite to say that time is flying by but eek, where do the days go? And I really want to blog just about everything I sew, if only I could sit down and do it. In particular I'm really satisfied at the response to my posts on items I've sewn for my friend Heather. As I say in my sewing classes, everyone probably needs some adjustments on a sewing pattern and I think showing how I get a nice fit on a variety of styles for her is useful. By the way - if I haven't mentioned it before, she is about 5'2" tall. I would love to know how tall people are when I read their blogs or pattern reviews, it really shows how patterns look on various figures and heights. Anyway - here's a silk blouse I made for her in November, we didn't have a chance to take a photo of it on her but perhaps I should blog it - I think the pattern envelope is not really very inspiring but it has very nice lines and sewed up well. Vogue 9086. Plus plenty of options via the seaming for fit adjustments, always a bonus! 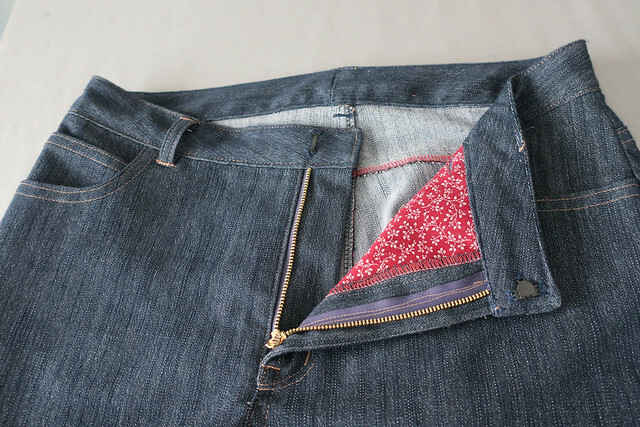 And a built in hidden-buttonhole front closure which is a great way to learn how to do that clever technique. Pants pattern poses: I love to see all the different variations on a pattern, on different body shapes, different fabrics etc. Thanks, Internet! But there are certain patterns that people rave about but to me they look slightly awkward in the photos - like they don't quite fit and if you stand a certain way it might disguise the fit issues. For the most part it's pants patterns where I notice this - I might as well get specific, it's those Persophene pants. A lot of what I can call a superman pose - hands on hips, feet apart. These pants have no side seam right? so not much shaping. Does it even matter? if the person likes how they feel that is the important thing. But it is interesting how the fashion pendulum swings from ankle squeezing skinny jeans to wide leg pants. Kind of fun to think what it might be 10 years from now, any predictions? Coat muslin out of felt: I happened to see a post recently where someone made their test garment for a coat pattern in felt. Genius! I think they sell cheap 60" wide felt at Joann's, so a low investment and it would behave more like a wool coat than thin muslin ever could. I might have to try this next time I'm doing a coat pattern. Classes at Hello Stitch Studio: This spring will be two years since I started teaching classes at Hello Stitch - that went by fast as well. We have a bunch of great classes coming up, however I am sorry/not sorry to say that most of the classes in Feb are sold out! It must be something in the air for 2019, I think lots of people finally resolved to learn to sew their own clothes, with more inquiries than ever before. We are doing a Level 1: Learn to Sew Series, the February sessions are full but it will repeat starting in April. and we will also have a Level 2: Learn to Sew series which will be a bit more advanced, and include some work on pattern fitting, plus zippers. We're working on a class series that will focus on Sleeves - how to adjust for fit, tips and tricks for how to sew in a beautiful sleeve, etc. So if you are interested in that let me know as we haven't finalized it on the schedule yet. A lot of our classes now are based on a specific sewing pattern, which is a good way to focus on some specific techniques. Spring is approaching and we have spots open in the Wrap dress class in late March, and the Bondi dress in April. But I would say if you are interested in a class - it's better to sign up as soon as you can, we do a waitlist if they are full but no guarantee a spot will open up. Still available: this upcoming weekend I'm doing the Ash jeans weekend workshop - there are some spots still open in this class. The pattern has really impressed me and I'm looking forward to seeing how it fits on a variety of people. Stone Mountain has the pattern and they have all kinds of great denim and kits if you want to buy everything you need at once. This is a 2-day class, with lunches included. So indulge yourself in a sewing weekend! By the way - you can use any jeans pattern so if you already own a jeans pattern feel free to use that. This dress will have long sleeves and I'm not convinced on the zipper - will have to get the back attached and see if it's needed. Now I want a teal colored coat. See...always something trying to get on the to-sew list. Stay warm everybody - sometimes I'm asked if I can even wear a coat here in California as it doesn't really get cold (not my words) anyway this morning at 8:00 am it was about 37℉ so to me that's cold. But by this afternoon it should be in the mid 60's ℉ so I guess I will shut up about the chilly weather. Eek, New England and the Great lakes - how do you survive??? Hang in there - spring is coming, soon I hope. 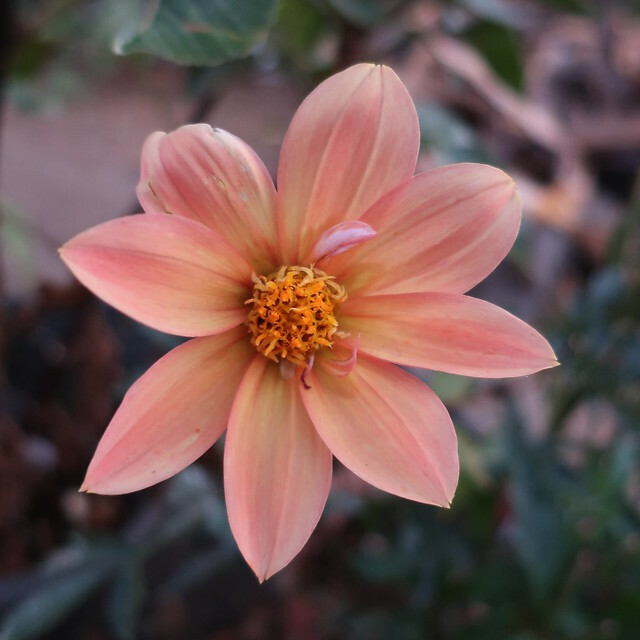 Today's garden photo - reaching back to September when I had all kinds of dahlias blooming. 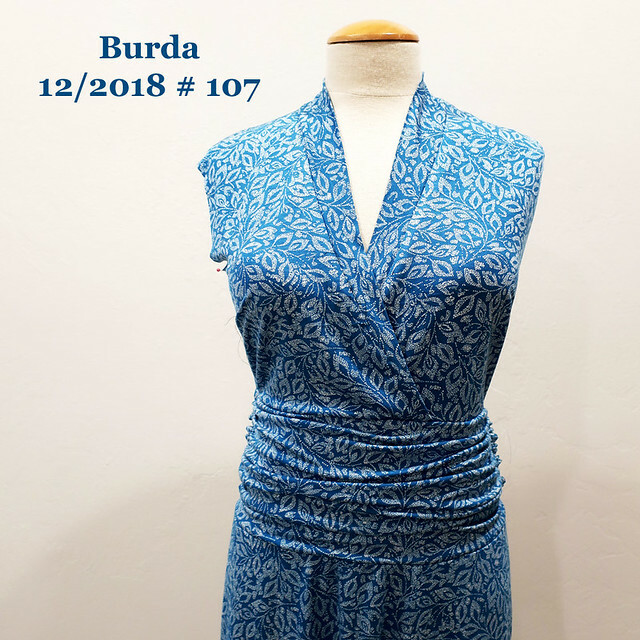 The December Burda dress is looking really nice. How do we survive in the NE? In a NYC apartment where the radiator blasts heat with no thermostat to regulate it - by wearing shorts. Really wish that thermostats were required in old buildings like this - the excess heat is such a waste. For what it's worth, when I was in CA for the holidays, I was froze. I was so not used to normal, not overheated interiors! It's all relative. A belated happy new year, Beth! It was 37F here all day with a bit of snow (Derbyshire UK). I think wide leg pants are easier to fit espeicially if someone has full front thighs and full calves, the wider trousers hide that better. As always, I enjoyed reading your random thoughts.. I'm going to work backwards...will you be doing the tailored jacket class again in 2019?! If so, I'd like to plan in advance! I have seen the felt as muslin for coats and agree that it is a fantastic idea! I don't use muslin to muslin very often because it has not helped me in the past. I do not like those Persophone pants. I was thinking that earlier today. It is harder sometimes to criticize a pattern without feeling/looking like you're criticizing the wearer. But the crotch is weird on them IMO. That coat IG is awesome. I love Michelle Obama in everything. RBG had on a couple of stunners and Liz Taylor's leopard coat was freaking fantastic. I am not a casual-dressing person. I'm just not. I have imposter syndrome when I, for example, wear athleisure. It just isn't me. I've been told for as long as I can remember that I'm "always dressed up". I don't care. LOL! I always make sure I buy one more button than needed and ESPECIALLY with expensive or stand-out buttons. IDK about the "need" to define things like 30 wears or clothes bringing you joy (what?) or 10 items for 10 days...it's too much overthinking for me. Measuring suit - Zozo suit?? Out of order now but I love her top is coming along! I almost bought that pattern. I should've trusted my instincts! measuring suit - yes it was the Zozo suit. Sewing mind meld here that you know what I'm talking about :) and re: the jacket class - will start thinking about that. Felt... to muslin a coat. Of course! Interesting that you find winter fancier than summer, I am tge complete opposite. In summer I will wear my pretty dresses and silk blouses when everyone else is in shorts and t-shirt, but in winter I revert to jeans and sweater (though I do wear smart jeans and a nice sweater rather than scruffy jeans and a hoody). One person’s dressed up is another’s dressed down. Where I am it’s very unusual for people to comment on clothes at all so one can be as fancy as one likes without any aannoying remarks! I second KS_Sews - zozo suit! I ordered myself one the other day and measured myself up - with a few other friends. We all agreed it was pretty accurate, but it overestimated the bust measurement for each of us. Most fascinating was the pic of your body dimensions it shows after measuring - it even shows which shoulder slopes more than the other and if you have protruding calves! Fascinating. That dahlia is a beauty! I'm doing the opposite with spare shirt buttons. I never snip them off and in handmade shirts I sew a spare one in to make sure they get the same wear and tear and discolouring from washing or other care methods. Dressy vs casual? I get blog comments telling me I'm overdressed while gardening in a (fancy?) handmade tee. So Indeed, one person's dressed up is another person's dressed down. Your discussion about "fancy" made me think again about my own clothing dilemma...I seem to have lots of "too fancy for everyday" clothes that I wear to work, and lots of "too dumpy to wear out and about" clothes that I wear at home. I need some nice in between casuals! I bought a HUGE amount of fabric online in December, but am still way behind on finishing some Christmas gifts because I had hand surgery. It was unplanned, and the recipients know the situation so they understand the long delay. It is getting better...slowly...and I want to start sewing! Thanks for the interesting post! I have also struggled with loving to sew dresses while my everyday life is not so much dress-friendly, apart from summer. But I tend to think about it like this - I sew for fun and I don´t have to necessarily only make things that will be worth the money, right? I have party dresses in my wardrobe that I have maybe worn 1-2 times, but I love them nevertheless, and yes, not able to let go of nearly anything I´ve made! Wow this post really spoke to me! I feel like 30 is such a small number, except for special occasion clothing. When I first read that, I thought, really, only 30, that is our 'sustainable' goal? I'm glad we are talking/thinking about it though. And as for the 'why are you so dressed up' question...that may be a North American thing. I don't know. I live in France and my impression is that the standard in the US for every day clothing is more casual than in Europe. I generalize! I hadn't seen that Instagram thread - love it - thank you very much! Thanks for doing a RT post. I too think a lot about how often I wear clothing, and why I reach for the same clothes again and again. The good news is almost every piece of clothing in my "active" clothing closet is made by me, or is something I truly love, even if it does not get much wear. Do you have a secondary closet? One with "less active" clothing, not worn or not worn often for one reason or another? I have a few items in that closet that are RTW, and were purchased because they were seriously marked down but are so beautiful for what they are - a soft batiste cotton lined with cotton skirt with a beautiful Mondrian-type color block print in a lovely and surprising color palette. And an amazing pin tucked ramie jacket in a gorgeous Caribbean blue for a mere $3 - it is a work of art! Or a jacket bought in Mongolia (a very specific Mongolian style), and then there are the vintage men's short kimono I used to wear as a suit jackets, etc. These clothes are more a collection than anything I would have an actual place to wear anymore. I guess they are costumes/party clothes. I save all of my buttons, but rarely buy any. I look for projects to use buttons on, but find myself sewing knits more and more (sigh). That Vogue pattern cover design isn't showing the pattern any love, that's for sure. I like your version, although it is difficult to appreciate the details given the print. Thanks for providing Heather's height. Please let her know your many readers do appreciate her allowing you to post her photos and particulars of fit, those posts are always very informative. I am trying to dress well, and think that precludes dressing too fancy, something I have been accused of, boo on them. Many people don't know the difference, they just feel upstaged by somebody who cares about how they look, frankly. These days I wear a uniform at work, so my curated outfits are mostly saved for travel. Speaking of which, in Rome a few weeks ago, my husband and I were mistaken a few times for locals by other locals, so that tells me we were dressed well enough to be taken for Europeans. I will take it as a compliment! On dressing "too fancy." I think the question itself is a sad commentary on our society. We've forgotten why we "dress fancy" in the first place - respect. Respect for the places you'll be in and the people there and for yourself. We roll out of bed and into jogging pants and a T-shirt for our college courses (taught by distinguished professors). We wear jeans to our houses of worship. We dress like slobs or tarts even for a job interview. It's so sad that when someone takes a few minutes to dress appropriately or put some extra effort into their look their seen as "dressing up" or "too fancy" or even "must be going to a party". I say keep on "dressing too fancy" if it means people think better of you and they know that you have respect for them or for the place you're in.